For about a week Anna has eaten very little other than breast milk. As it came on the back of a trip home from Denmark, a nasty wasp sting and a fever, we thought she was just ill but a week on with no remaining symptoms, I was starting to worry. I even bought some first stage baby food again in case we were rushing her with too grown-up food. But on Saturday night, when she wouldn't even eat that I was at the end of my tether. I offered her a spoonful of the cannelloni I was eating myself and she opened her mouth wide. It seemed she wanted more grown-up food - in fact she wanted the same as the rest of us. Not content with that she decided she'd rather try to feed herself. I'm not sure how much of Marcel's home-made lasagne actually hit the target yesterday evening but you must say she's looking very pleased with herself. 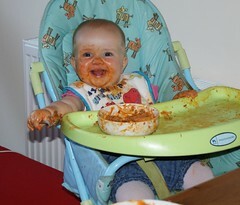 Poor Thomas had to take all his clothes off to take her out the high chair, she was so dirty! I should have got a photo of that - it was quite a sight!